Tomb Raider has had films made before which were great, but this adaptation doesn't hurt it in the slightest with a great story and adventure to go along with it. Pros: The thrill of an adventure movie like Tomb Raider is always something I enjoy and Alicia Vikander as Lara made that great to see. Nothing against Angelina Jolie's take on the video game character which those were great too but Alicia's take on Lara was more in tune with the story from the video games. Action scenes and parts where she had to use stealth made it feel like a video game and it was exciting. I liked the tomb and all its deadly traps. The objective of such tomb, in the end, was really cool if you were in detective mode throughout the movie to put the pieces together, which I wasn't and I was surprised. Cons: You get a typical villain of the story and I just couldn't take him seriously -- maybe because the last time I saw him was on an HBO comedy called Vice Principals but Walton Goggins still had some good moments where he made you hate him on screen but only some. Alicia Vikander, bless her heart, got annoying with her grunts and screaming. Great actress, but it got in the way of the movie. 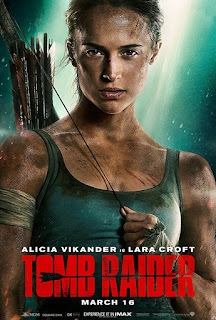 Tomb Raider ended with a setup for a sequel and you'll see that she's up against an evil bigger than just herself so seeing more Alicia Vikander as Lara is something to be excited for. Trust me when I say this, this was a whole lot better than that last crappy film video game adaptation, Assasins Creed. Go check out this entertaining movie!